With the release of the new live-action Dumbo movie now less than a year away, Disney has released the official synopsis of their next reboot after Christopher Robin. Unlike the original movie, however, it would appear that the protagonist this time around is a human played by Colin Farrell rather than Dumbo himself. The reboot, which is now in its post-production stages, is directed by the visionary storyteller Tim Burton. It will also include a number of well known actors, including Colin Farrell, Danny Devito, Eva Green, Alan Arkin, and Michael Keaton, all of whom are playing human characters rather than voicing animals as some people predicted. The official synopsis for Dumbo shows that it will be a lot different tonally from the classic 1941 animated movie. Here is Disney's official synopsis of the reboot. "Holt was once a circus star but he went off to war and when he returned, it had terribly altered him. Circus owner Max Medici (Danny DeVito) hires him to take care of Dumbo, a newborn elephant whose oversized ears make him the laughing stock of the struggling circus troupe. But when Holt's children discover that Dumbo can fly, entrepreneur V.A. Vandevere (Michael Keaton), and aerial artist Colette Marchant (Eva Green) swoop in to make the little elephant a star." Based on what we can tell, the new Dumbo movie will be a new story for the famous elephant. While the original movie did show Dumbo as a "laughing stock," it didn't actually show Dumbo proving everyone wrong by flying until the third act of the movie. 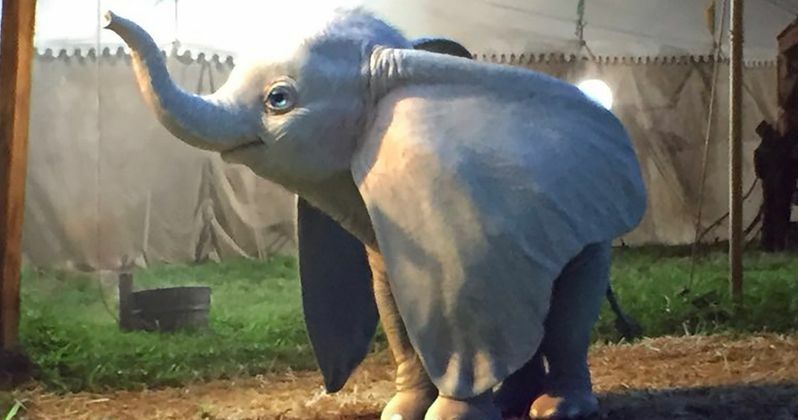 Based on information from CinemaCon in April, the new Dumbo will feature the elephant flying towards the beginning of the movie, and then follow what happens to him after he gains this talent. One of the biggest complaints about live-action Disney reboots like Beauty and the Beast is that they tell the same story over again with very little changes to them. It would seem that Dumbo will be an exception to this, finally showing what happens to the titular elephant after the events of the first movie. In a way, it may be set up as a live-action sequel, but those details are still a bit too hazy to determine. The idea of following Holt rather than Dumbo as the protagonist is actually a clever idea, and may give us a clue as to what the central conflict of the movie will really be. Being his caretaker, Holt is sure to bond with Dumbo during the events of the movie. Once Dumbo starts to become famous, Holt may feel guilty for the way he may be treated by his new caretakers and intervene in order to protect his elephant friend. This plot would be similar to the live-action Alvin and the Chipmunks, but hopefully it will be done a lot better. With the synopsis now released, it's quite likely that Disney will be giving us at least a teaser trailer for the live-action Dumbo. Some footage was shown at CinemaCon last month, so hopefully some sort of trailer won't be too far off. Dumbo releases in theaters March 29, 2019.